This Friday the 7th of February sees Australian tastemakers Future Classic present one of Norway’s finest exports Cashmere Cat for his only Sydney sideshow. Following on from his sell out Vivid headline show at the Opera House in 2013, it’s clear Cashmere Cat’s sound is in huge demand. Cashmere Cat’s own music is equal parts glittering RnB, touching on French electro, driven by the heavyweight bottom end of 2000s club Hip Hop. This is forward thinking and unabashedly bright new dance music! With support and huge respect from some of the world’s biggest producers and DJs, Cashmere Cat’s 2014 looks to be blowing up even more. 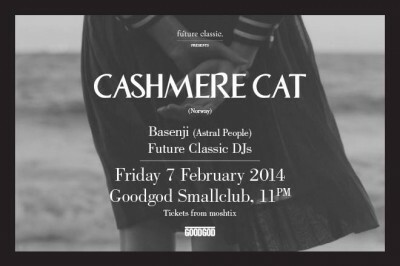 Expect a heaving night of amazing vibes and a rare chance to catch Cashmere Cat in the intimate surrounds of the Goodgod Danceteria. Support duties come from Sydney up and comer Basenji and the always on point Future Classic DJs. Listen to Cashmere Cat’s amazing tune Mirror Maru below.